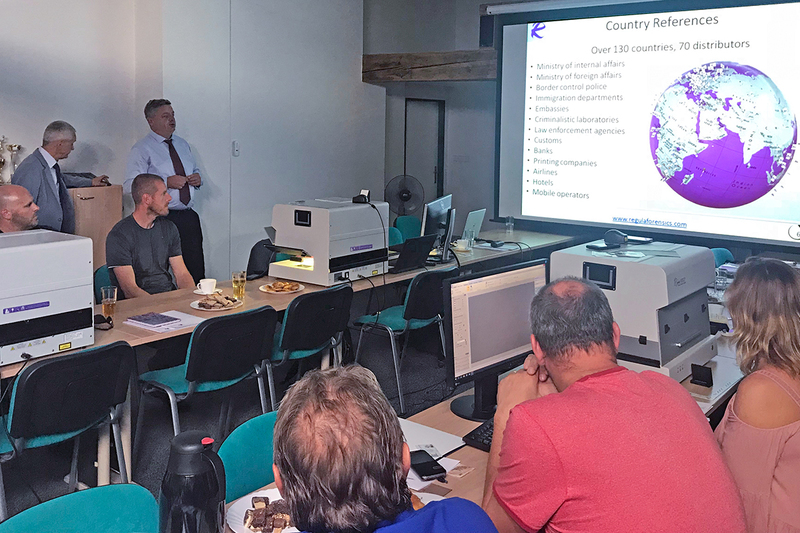 Regula together with its exclusive partner in the Czech Republic NORITEK, represented by their Executive Director, Mr. Jiri Votypka, conducted several training events for law enforcement officers of the Czech Republic (10-12 October, 2018). On October 10, Regula demonstrated the company’s latest solutions in Prague. The format of the meeting allowed the officers to experience the full range of document and banknote authenticity control devices, as well as information reference systems. Furthermore, Regula representatives, Mr. Andrei Dumski and Mr. Vladimir Levitanov provided an overview of the main algorithms for forged document detection. The parties discussed plans for future cooperation. On October 11–12, specialized training classes were held for representatives of border police in České Budějovice. During the training, the police officers acquired both theoretical knowledge and practical skills on technical and forensic examination of documents using the video spectral comparator Regula 4307 and the software Regula Forensic Studio. Regula will continue to provide similar training opportunities together with its business partners for other countries and regions.